There is no time, only now. Your thoughts are the only thing creating any change in your reality. Whatever you expect will come. When you change your expectations, you change your reality. How do you change your expectations? An expectation is what you believe is most likely to happen. You must change your beliefs to change your expectations. Beliefs are just thoughts you think a lot. Change your beliefs by changing your thoughts. One benefit of entheogens is that they can remove all limiting beliefs for a brief period of time, allowing you to change your expectations (and therefore reality) in an instant. Dreams are similar, and for that reason I'm introducing lucid dreaming into my life design studies. Your dreams are indicators of thoughts you're thinking. They are precursors to your future. Lucid dreaming is a way of consciously directing your dreams. When you can control your reality precursors, imagine how your waking reality might be affected! 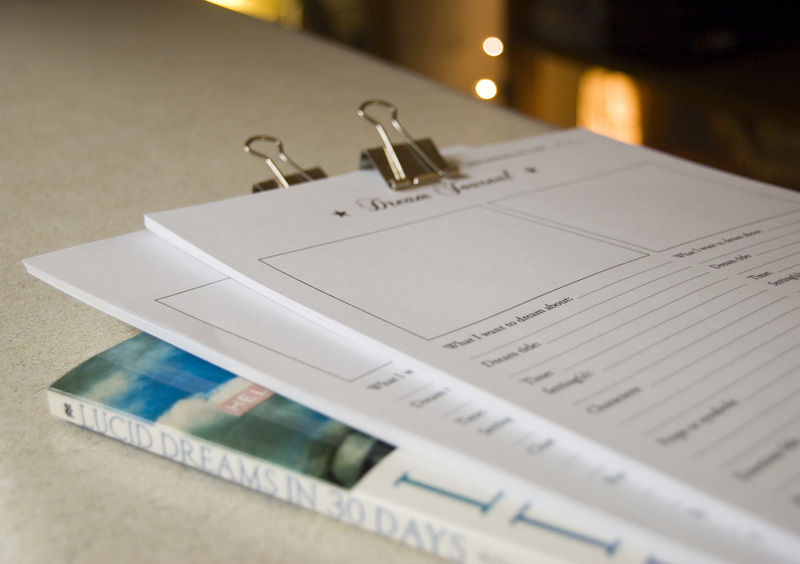 The book suggests keeping a dream journal with various important bits of information about each dream like setting, characters, and emotions felt. It sounded like a daunting amount of things to remember to write down after every dream, so I made us a beautiful worksheet to use! I printed out 30 copies of it and bound them with a binder clip and am now storing the booklet under my pillow. To start, the instructions are simply to create the journal, find a special pen to use only with your journal, and then keep it by your bed. They encourage you to affirm your willingness to remember your dreams before falling asleep. Then, when you wake, stay still with your eyes closed for a few minutes until you have remembered what you want from your dream. Write down as much as you can, and use the blank box to draw pictures if it helps. I'm so excited to be finding fresh paths in life design to explore! I'd love to hear of your own lucid dreaming practice if you have one or want to start with me! So excited to hear about what this leads to and how fast it starts working!! Me too! I wanted to start this morning but I forgot all my dreams! I think it may take longer than 30 days, but all that matters is trying. I’ve always wanted to get into lucid dreaming (and tried for a while after reading a lot of Carlos Castaneda). The time seems right now! SO much fun! Allison, do you remember your dreams or ever have lucid dreams? I have been lucid dreaming since I was very little. I vividly remember dreams when I was 6…but no one ever told me what it was called, so I never told anybody until a friend in high school spent an entire summer with the prime focus to be proficient in lucid dreaming. Writing down your dreams is absolutely the best way for beginners to get to lucid dreaming. Even if you aren’t “lucid”, your dream recall will improve exponentially! Over time you will be able to remember multiple dreams a night. Eventually the habit of writing dreams will become a part of your morning routine, and you’ll be amazed at how much fun waking up is! Also, if you ever wake up early on a weekend, go back to bed and really “relax”…you may be able to initiate a WILD: Wake Induced Lucid Dream. WILD dreams seem more vivid to me! i love this idea! so cool. probably would be pretty rad to fill in the journal even without doing the program! can’t wait to hear how you’re doing with it. I can remember my dreams if I try, I usually only bother to remember if there was something particularly weird or epic in them though. I actually had a lucid dream about 2 months ago for the first time in a LONG time… I suddenly had the sense of “this feels like a dream” and then I tested turning a light switch off and on and nothing happened (supposedly, in dreams, flicking light switches has no effect on the lighting). And it was like YAY WHOA but then I got distracted so it didn’t last very long. It’s a skill that I would love to develop! I keep meaning to! Annie, AWESOME!!! Please share your progress! I ADORE what you’re doing with your site, plus BRIL name for it!!! Allison, isn’t it weird how lucid dreaming can get so back burnered? I have a feeling it would be super life changing but it just seems so unreal compared to waking life! Heidi, you are so cool! Do you lucid dream every night? What do you think about it? Does your dreaming life ever become more important or interesting than waking life?